BFC DJ Flight Cases is a versatile DJ arrangement suitable for any budding amateur to the professional setup. 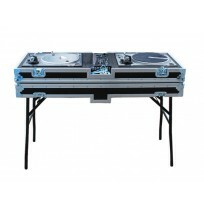 The DJ Case also has pad-lockable catches allowing the case to be secured safely. You need dj case? You can find it at us. We have different range of guitar cases, stands, mixer, rackmount case and more for the best price in uk, becouse we now you need just best flightcase.